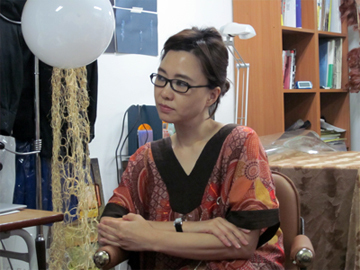 Artist Minouk LIM, already actively engaged as a modern artist, has made herself known in the field of Korean performing arts as well through her two works SOS-Adoptive Dissensus and Fire Cliff 2 at the "Festival Bo: m" multidisciplinary arts festival. Fire Cliff is a site-specific performance project having 1,2 series released up until now, and has been selected as PAMS Choice of Performing Arts Market in Seoul(PMAS) this year. This work goes beyond the category of multi genre and creates focus on the "artist." As the Fire Cliff suggested the future direction for a portion of Korean Performing Arts, it received the following evaluation from the judges, "The work's awareness of issues wasn't biased towards format or content, and the invigorating direct movement toward implementing the reality of issues and artistic nature by boldly breaking such framework was noticeable. "I wonder if there is any praise higher than this to an artist? This is the reason why the name Minouk LIM is attracting attention. Thanks to the interview, I got to visit her studio. Q: Thank you for inviting me to your studio. I heard that you've visited U.S. not long ago, could you tell me why you made the trip? A: Because my studio is next to the Jung-gu Office, I hear daily ringing of protest songs about the redevelopment compensation when I'm doing my work. I know it's a little distracting, but thank you for coming here. I got an invitation for solo exhibition at Walker Art Center in U.S., so I visited for pre-site visit and meeting. I am preparing for exhibition in Rotterdam in early September with the title 《Melanchotopia》and solo exhibition at PKM gallery at the end of September. I am also, unexpectedly, scheduled to show the Fire Cliff series at the "Experimental Film and Video Festival in Seoul" this year. Q: "People and memory" was the key phrase that was mentioned in introductions during interviews with several media in the past. I think the current issues and the topic of the artwork goes hand in hand with this key phrase. In retrospect, at what stage do you believe that your creative activities are currently standing? A: I think I was within the lines of conceptual art when I came back from studying abroad in France. I was immersed with considering subversive proposals within the lines of avant-garde aesthetics, but the fact that I had to organize something administratively was my biggest stumbling block. I have now become so focused on the memory issues of separated individuals with exclusion from "Placeness." I wanted to show the side of unpleasant stories, situations that had to be oppressed and neglected, and the undeniable reality of darkness that is hidden in the dualistic facet of "light." The reason for using the thermal camera for my work was also in this context. Thermal camera is a medium that is designed to pick up temperature even in darkness. A human being will become ill if the body temperature rises above 36.5 degrees and become a corpse when it becomes lower than that. The fact that the sense of balance and liveliness of humans are closely related to temperature began to, once again, sink in. This is why I am working with the acknowledgement of such notion of temperature and the awareness of issues in the loss of senses. And because of this, my eyes sometimes naturally become thermal cameras. Although, most thermal cameras are mainly used for surveillance, I exclusively use it for my work. I believe the stage of my work is starting to be expressed in the idea of "Touching," stemming from the contemplation of "How will I embrace it?" since I had moved on from "seeing." The Weight of Hands; A performance in a road movie format. 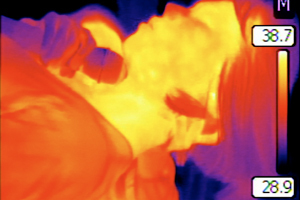 A single-channel video work which was recorded with a thermal camera. Fire Cliff; Site-specific performance project. It was performed at a 200 year old cigarette plant in Madrid Spain, at Defense Security Command in Yongsan Seoul, and at Baek Seong-hui and Jang Min-ho Theater of National Theater Company of Korea. Q: When I look at your work, I feel that it doesn't draw on the life of a person, but heavily centers around the communication with the world. What is "communication" to Minouk LIM? A: In fact, I am preceded with discomfort when the idea "dreaming of communication" is mentioned. It's because it sounds like a marketing scheme for money and power hungry politician or telecommunication company. I am concerned that there might be misunderstanding of the communication as only descriptions and skills of seduction. This is where it can be very misleading, but the artwork itself in the process of art, maintains the state of form that is unable to be "described. "It is a form which doesn't exist as "words," but a state of resistance to "words. "However, it can also be seen as a repeated possibility to different "words." In my case, I think about the Korean saying, "Try to catch two rabbits at one, and lose both." Here, I can think of one rabbit as communication and the other one that escaped the trap of logic and rationalism. I want to catch them both. Then, I realize that I've lost both of them. My work process is the confirmation of such loss. So, I try again. As I continuously fail to catch both rabbits, my work paradoxically becomes the resulting art that confirms life and existence. Communication is, of course, important. But, my interest lies in creating a certain form or inventing a format of communication. I am imagining wit and invention of a format who can "blow the whistle" on something that no one dares to say, which will be an innovation of communication completely different than the telecommunication companies. We are not beings that can start speaking at birth. But, we are reborn into a subject with power after we learn to speak. In other words, our communication becomes limited as we learn how to classify our aesthetic judgments into low and high levels. In the midst of this, the rejection of aesthetic hegemony and the effort to break the supremacy of a language are associated with creative activity. However, if this kind of effort doesn't go hand-in-hand with the invention of format, it will result in a communication without direction, even though physical communication might be possible. Without the sense of direction, communication will just linger around and eventually be left with abject daily routine. Spreading ideas became easy because we are in an era where anyone can take advantage of social networks. But, people don't say the really important things and the networks are filled with talks that anyone can say, so in turn people say things that doesn't need to be said, and say things that is not worthy for listening. For example, how ghastly is the color theory? Maybe this is the reason why Fire Cliff 2 was started. Like this, creative activity tries to simultaneously express the challenge of communication, logic, and doubts about rationalism. Q: Then, what is the ultimate story you would like to tell through communication? A: Even though, the communication media has been developed, it has become more difficult to talk about each individual's sadness. There is no one to listen, while our longing to make our sorrows known overflows. They say, let's all party. It's because, everyone is going through tough times. There is a phrase "Dynamic Korea" which came from such situations. I vacantly stare and think about the phrase. Ironically, the emptiness of the word "dynamic" is slowly leading my works to respond to the sense of loss. I think my works these days resemble inventing formality and consciousness for honoring one such life. Can a commercial movie do this? Would broadcasting medias embrace such sorrows? The duality of a being and object, the unwritten history... Art can create a secretive communication at this point, like a person embracing another. As far as I know, I wish for my current work to gaze at the duality of sorrow even in the people who are joyously dancing and singing. It is about bringing out the hidden fact that there are beings who have sunk down to the earth from tall buildings that seem to touch the sky. This is why the "kind savage," referred in my work, resurfaces rather than diminishing. Q: Do you personally have the most memorable artwork that you want it to further develop and be communicated to the audience? A: Recently shown Fire Cliff 2 through the Festival Bo:m program at the National Theater Company of Korea was an experience that reminded me to be rational even though I was filled with sorrow, and it had brought worries in various ways. As an artist who create challenging and dangerous works each time, I desire for opportunities to always learn something through such works. On the other hand, I began to raise questions as to what universality is, in the midst of the current work. I began to ask questions on the global universality that has been judged through aesthetic judgment with removed context. Can one say that this artwork is meaningless if it cannot be recognized globally? I am thinking of what the aesthetic standard is that we speak of. Q: Essays on various books are being recorded on pages of press releases and through personal blogs. What was the most memorable book that you've read recently? A: John Berger's books have been widely read as reference by art students. But, this month, I've been brooding over 『From A to X: A Story in Letters』. This book is in a letter format where a pharmacist, Aida, writes letters to her lover, Xavier, who has been imprisoned with double life sentence for convicted charges of forming a terrorist organization. A double life sentence is a punishment where even the casket of the deceased can't leave the prison. 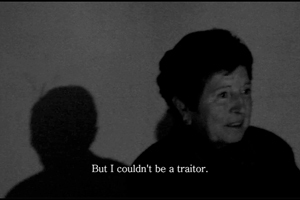 The woman silently records her daily happenings and life of waiting her love, and sends them to the man, while the man adds short essays on inequality of accelerated neo-liberalism, Mexico's farmer resistance movement, and how the U.S. is dragging the whole world into a deep pit of financial debt. A and X is not simply love letters about longing, waiting, and parting between a man and a woman. It is "depicting the most personal feelings, politics at a global scale, and economic issues into a one world." It has the configuration of showing the existence of beings on a different level, language, and the world all at the same time. The way I carry out my artwork and the way I speak are also focused on depicting the co-existence of the disparate, duality, or multi-layered aspect of things. John Berger did not face away from the suffering around the world ad a novelist, art critic, and poet. As the saying by Susan Sontag, I do not want to lose affection for the world of emotions, but be responsible as an artist even in this world where inequality is spreading at a faster rate.